Since its founding in 1946, the Juilliard String Quartet has built a comprehensive repertoire of some 500 works, ranging from the great classical masters to composers of the current century. The quartet performed the premiere performances of Bartók six string quartets in the United States and it was instrumental in rescuing the string quartets of Arnold from obscurity. An ardent champion of con- temporary American music, the Quartet has performed the premiere performances of more than 60 compositions of American composers. The Juilliard Quartet is quartet-in-residence at the Juilliard School and from 1962 at the Library of Congress in Washington, D.C. The original members were Robert Mann, Robert Koff, Rafael Hillyer and Arthur Winograd. Robert Mann, who retired after fifty years in 1997, was succeeded by Joel Smirnoff and Nick Eanet in 2009; Robert Koff was succeeded by Isidore Cohen in 1958, Earl Carlyss in 1966, Joel Smirnoff in 1986 and by Ronald Copes in 1997; Samuel Rhodes replaced the original violist, Rafael Hillyer, in 1969; the original cellist, Arthur Winograd, was succeeded in 1955 by Claus Adam and by Joel Krosnick in 1974. The ensemble has been associated with Columbia Records - today owned by Sony Classical - since 1949. In celebration of the Quartet's 50th anniversary, Sony released seven CDs of notable performances from the Quartet's discography. With more than 100 releases to its credit, the Juilliard String Quartet is one of the most widely recorded ensembles of our time. Its recordings of the complete Beethoven Quartets, the complete Schoenberg Quartets, and the Debussy and Ravel String Quartets have received Grammy Awards. Introduced into the Hall of Fame of the National Academy for Recording Arts and Sciences in 1986 for its recording of the complete Bartók String Quartets, the Juilliard Quartet was awarded the Deutsche Schallplattenkritik Prize in 1993 for Lifetime Achievement in the recording industry. 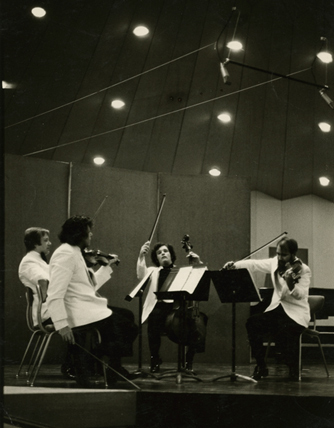 The Quartet played an important role in the formation of new American ensembles and was instrumental in the founding of the Alexander, American, Brentano, Colorado, Concord, Emerson, Lark, La Salle, Mendelssohn, New World, Tokyo, Shanghai, and St. Lawrence string quartets.